The Roundtable included working group sessions that allowed smaller groups of participants to do a deeper dive to explore and develop practical strategies to accelerate the development of library-centered innovation. The Roundtable included working group sessions that allowed smaller groups of participants to do a deeper dive to explore and develop practical strategies to accelerate the development of library-centered innovation. The groups were convened around three priorities. Each group identified an opportunity or problem as the inspiration for their collaboration and deliberations. On the last day of the roundtable, each group presented its big idea. Communities are segregated by wealth, which leads to economic immobility. There are few, if any, spaces in communities that are compelling and accessible for people across the economic spectrum. Libraries are uniquely positioned to provide “superconnectivity” across the entire community, regardless of income, compelling community members to engage. Technology: The superconnected library is the only place that provides free, reliable, “super” high-speed (10G) connectivity. Such amazing connectivity is a compelling reason for people of every wealth and social status to come to the library, to get what they cannot get anywhere else in the community. People: In the superconnected library, staff are reimagined as community activators. The idea of superconnectivity applies to the capacity of the library to leverage its high-speed technological capacity and its well-designed and engaging physical spaces to facilitate the development of interpersonal relationships, collaborations, human capital. Public Space: The superconnected library is a collaboration space enabled by technology and materials. Libraries are open longer, drawing from co-working space models to provide simple but critical services. The superconnected library is not issue-driven; rather, it is agnostic in terms of the work that is done. The library provides the space and platform for people to do all sorts of things: immigration, immunization, business, community organization, learning, early childhood. It is a place that connects the private and public sectors, business and government, work and play. The superconnected library incorporates key ideas raised during the roundtable. It adapts the Teach for America model and employs “Librarians for America” to infuse the library with young, mission-driven talent. E-rate technology funding, which is more widely distributed through the use of a Turbo Tax-like tool, is leveraged to build the 10G connectivity which lures private sector workers, entrepreneurs and university researchers to tinker and experiment at the library, and imagine new ways of doing things with the awesome technical capacity. Progress toward creating the superconnected library can be accelerated by support in filing E-rate applications and an overall simplified application process (to overcome the barriers mentioned earlier in this report). The superconnected library does not exist without the technological capacity described, even if many patrons never take advantage of its presence. More highly visible demonstrations of supercomputing power that help people to see the future would also help to speed progress. Librarians and others can create demonstration sites to fire the imagination. This will require librarians and the community to consider deeply what superconnectivity enables. Libraries should develop a compelling narrative and seek partners as additional action steps to create more value in the future. Finally, changes in library science education that prepare librarians to be the leaders, mentors and curators of the superconnected library will play a role in how quickly Superconnectivity moves from the white board to reality. In summary, the superconnected library enables collaboration and unparalleled access, leading to a reduction in America’s massive inequality and an increase in economic prosperity. There are many important national issues that affect individuals and communities at the local level for which there is no good forum for broad public discussion. A fragmented media environment means commercial brands are no longer doing an effective job at providing platforms for civil discourse and debate. Libraries have a civic responsibility to fill the vacuum. America’s Civic Square (ACS) creates a movement that brings together much of the work libraries are already doing, but aggregates these activities to create a moment and lead to action. ACS creates a network of libraries across America and builds a social and technological platform that can be leveraged at the national and local levels. Network Effects. Working with sponsors (who would change from year to year), ACS sponsors a series of events happening simultaneously in libraries across America. One day a year all libraries have a community-wide conversation and debate on a shared topic, with an expectation of commitment from the audience. Convening a conversation nationally can produce a level of visibility for the topic, the public’s preferred solutions and the libraries themselves. The “Doing” Part. Importantly, ACS touches on things that libraries are already doing (exhibitions, collections, programming, curriculum), but also incorporates dynamic new ideas that can spread across the national network (pop-ups, teenage cool hunters—engaging teenagers to go out and find people with diverse points of view on topics and interview them). ACS allows libraries to put a public relations frame around existing programs, activities and services and then build a larger conversation around them. It supports the conversation among all libraries by making it turnkey in terms of resources. Posters can be customized and printed for promotion, for example. ACS is a pull platform; it needs people to want to participate. America’s Civic Square provides an opportunity for libraries to be that rare neutral platform that can create large conversations. Libraries are, arguably, the most trusted and diverse network out there. Taking health as an example, America’s Civic Square can look at proactive communications campaigns to get out in front of health issues in communities, anything from immunizations to Planned Parenthood. In the borough of Queens, it is difficult to reach the Asian community that lives there. Libraries needed help to provide information to the Asian community, so the Queens Public Library partnered with Planned Parenthood. Planned Parenthood set up shop in a branch of the Queens library to help educate and train staff. One could imagine other national discussion topics being connected to the work that libraries are already doing. For example, the Cleveland Public Library’s passport processing service (for which the library collects a fee) could lead to community conversations on immigration, making data on immigration available, classes, partnering with nonprofits that work with immigrants, playing an ambassador role in individual neighborhoods, digital or translation services, a culinary ambassador program. The library is not taking a position on immigration reform issues, but providing services which is the work that libraries do. ACS looks at range of ways that libraries can host a campaign but also do active work on individual issues. This proposal is mindful of the excellent work done in the past by America Speaks. The distinction of ACS is that it is building on an existing set of networks and the assets of the libraries (buildings, technology, people). ACS is building on top of the library platform. It’s that layer of coordination on top that dynamically increases the impact. Participants felt that libraries have a unique opportunity to aggregate and curate national conversations and are in a moment that they can do so. It will require a branding opportunity to coordinate on top of it, but this is not nearly as hard as the other assets (e.g., buildings) that are already there. This can be done by the largest urban library or by small libraries in tiny little towns. Libraries as Heroes. Inspired by libraries being hubs, ACS sees that some libraries can be heroes. What can we learn from this moment of crisis or urgency? How can we leverage what libraries can do already as a hero rather than waiting for something to happen? Building-in Innovation. ACS would promote the creation of innovation labs in the libraries that participate, inviting entrepreneurs to come in and have lab spaces. This could create a revenue stream. Start-ups can get assistance from libraries so that the library functions as an accelerator. Libraries are aggregating the conversation through the use of social media and the libraries’ other assets. It rests on the library’s shoulders to make it successful for their individual community. The events themselves become part of a larger archive. The media and content that are created becomes an evergreen touchstone curated at and by the library. App-Library uses the metaphor of the app (think: App Store) to develop opportunities for learning and creativity in libraries. It seeks to define a way for other people to initiate and contribute in this platform. Instead of focusing on supercomputing, App-Library focuses on the people piece of the library and its services. App-Library focuses on early childhood education and informal learning, two things that public libraries do well. App-Library asks, How do people fall out of the traditional educational system or re-training? How do they actually engage with the library to continue that trajectory? In both cases, it is easy to identify opportunities and activities that could be created by overlapping the edges of the library platform and others in the community—partnerships, collaborations, ideas—but the fundamental challenge is that there is no underlying support structure to allow these ideas into the library. App-Library is more than a library API for informal learning, more than a learning output. A library API can clearly describe what the opportunities are, but falls down because it is not describing an ecosystem. App-Library helps libraries to figure out how to curate these services—what can come into the library’s learning ecosystem and what can’t. The Basic Idea. The library as a platform already provides all types of early childhood and informal learning services, from story time to checking out books. The part that does not exist is an easy way for people to come into the library and start a tutoring program, or a local healthcare organization to come in and start a health literacy program. If the library is increasingly about experiences, what if we describe the library as marketplace of experiences? Permission Frameworks. Some libraries already have a framework for coming into the library as a partner. App-Library uses the need for permission to drive innovation by building frameworks where people can seek permission. App-Library looks at the rules and frameworks that people use to access space or other resources and builds around those. Comparing to the example of the App Store, there is a submission process to get into the App Store. In App-Library, there is a submission process to get into the library. Apple provides the developer with tools and kits for people to code things. App-Library, facilitated by technology, defines guidelines and provides partners with resources to get started. 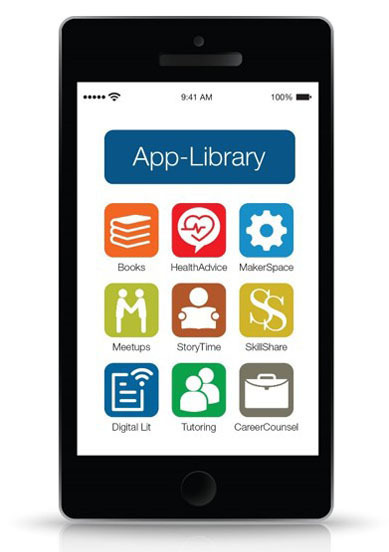 App-Library employs library vetting to ensure that the proposed program aligns with the library’s strategic needs and the needs of the community, that the partner has the capacity to do the work and deliver good outcomes and impact. App-Library would describe the specific framework that any participant needs to have. Librarians doing the vetting would work with the person or organization trying to set up a new experience. Borrowing from the app development world, a critical component of App-Library is a set of design guidelines (e.g., Apple and Google have HCI), but it is important to remember that App-Library is not about creating a virtual platform but a physical one for libraries. These design guidelines could be about privacy, standards for accessibility or localization. The important thing is that they set up very clearly standards for people who want to collaborate with the library. Quick start kits might be a good place to help people get started. App-Library would create a resource so that people who want to start on a smaller program can have a kit (more than just the design guidelines), one that shows one or more examples of a successful program. Improving the Marketplace of Experiences. Focusing on services the library already provides, App-Library would explore how the library can broaden the set of experiences available to the community. Take for example story time. App-Library would look at what sort of attributes could be added to a service like story time. App-Library would get feedback about usage and participation and formalizing metrics so that across each service, the library knows what is performing well and what isn’t. Eventually, App-Library creates a model where these service designs have the expectation of frequent updates, just as apps are updated frequently by developers in Apple’s App Store. App-Library asks, What are some ways in which we could more rapidly iterate on these services in the library? App-Library makes available the library’s existing assets (books, media, online resources, curriculum) to be used for external collaboration. And it makes it easier for patrons to identify and find the learning and creative activities that interest them. The library card thus becomes a gateway to “apps” of all kinds. App-Library provides a framework within which innovation can occur on top of the library’s platform. App-Library makes it possible to leverage the library to do some really cool things. It pushes the library beyond just the logical partners, to the unlikely apps or collaborators and provides a means to get those out in a more deliberate way. The model could plug into hacker space, individuals in the community interested in skill sharing, or individuals interested in tutoring. App-Library helps libraries to consider how communities are enabled to write back to libraries. It is about check in, not check out.